Balt 27692 Trend teacher's mobile podium desk offers durable PVC surfaces in a cherry finish. 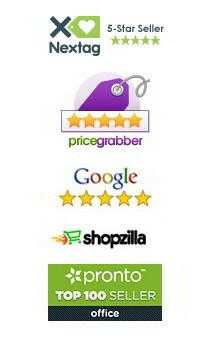 The tilted podium top features 6" of height adjustment. Two adjustable shelves for storage convenience. Dimensions: 60" W x 24.5" D x 43" to 49" H.
Balt 27692 Trend 60" W teacher's mobile podium desk offers vacuum formed PVC surfaces with a cherry woodgrain finish. The tilted podium top with pencil stop has a height adjustment range of 6" and locks into place for reliable use. Grommets in the desktop and podium body provide easy cable management. The perforated modesty panel ensures seated privacy. The durable powder-coat steel frame includes 3" non-marring swivel casters. Greenguard certified. Ships ready to assemble. 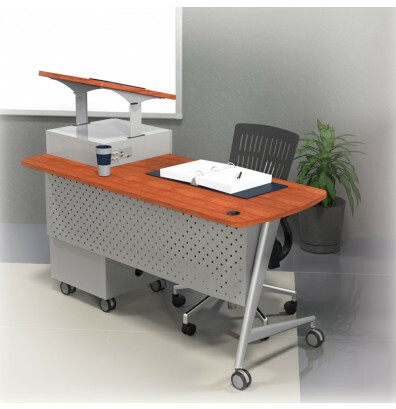 The 27692 Trend podium desk features ample storage ability. 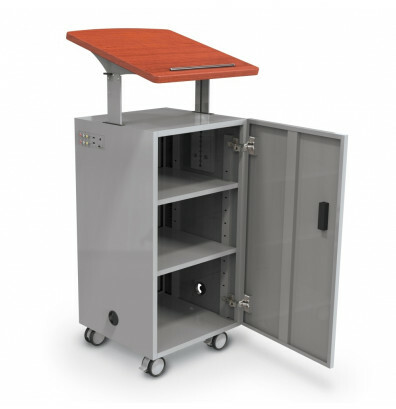 The podium body is designed with a cabinet that includes two adjustable shelves. The cabinet locks for added security and comes with two keys. 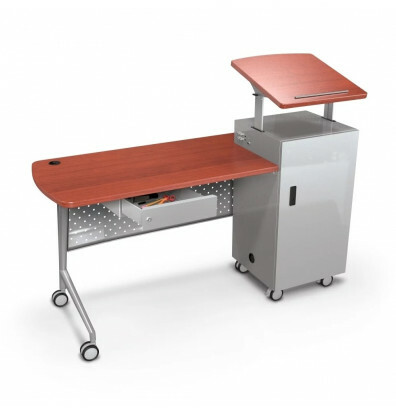 This Balt teacher's mobile podium desk is also available without the desk. Optional accessories for this podium desk include the pop-up grommet with outlets / charging ports and AV panel. Rolls smoothly for easy repositioning.